As I mentioned, we made the trek home to Chicago a few weeks before Christmas this year. One reason is that airport travel around the holiday is nuts. Another reason is that some of our family goes out of town for Christmas. But the main reason is that we have never had our own Christmas morning in our own home, with our own tree, our own gifts, etc. I know it may sound selfish, but now that Brady is getting older and understands the holidays a bit more, we wanted him to be able to experience what it's like to wake up on Christmas morning and see what Santa brought for him and his little brother. Even though we didn't get to see everyone for as long as we'd like (the trip home is always too short! ), we think it ended up working out well for our families too. We spent the first half of the week in Plainfield with my family, and the second half of the week in Park Ridge with Matt's. It was so nice getting to spend time with our nieces, who we only get to see via Skype, and for the boys to get to spend time with all their aunts and uncles. This was the first time Cole met Aunt Lindsay, Uncle Jason, Uncle Justin and Aunt Megan (and of course, Aubrey and Reese). We cannot wait until we move home and all the kids can grow up together! 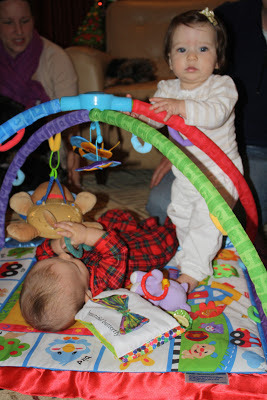 Cole encountering his first Christmas gift! Watch out Reese, he's almost as big as you!